PROSATIO SILBAN WAS NOT KNOWN for nothing as “The Cook For Any Price.” He had long ago foresworn the Sacreanthood and serving people’s souls for serving their bellies and letting the souls look after themselves. Yet every now and again, he wondered if his gods were still playing tricks on him. He was cleaning up his galleywagon late one night at the edge of one of Soharis’ more workaday fish markets, making ready to fold down the canopy-bulkhead, when the Siddis appeared. Now, to understand this story, you must know that cosmopolitan Soharis, perched on the edge of the Rimless Sea and the Lands of Exile beyond the sunset, is the sort of place where one may expect to meet almost anyone at almost any time. But at that, it is rare to meet a Siddis — more properly the Siddis, since only has one ever been seen anywhere, and of that rose-red robe-wrapped one little is known save that they or he inhabited a city somewhere in the Great Eastern Desert and their or his presence portended unsettling things. “Done.” Prosatio Silban proffered a folding chair-and-table, his guest sat, and the cook ascended into the galleywagon. Jaraanga beans are easy to fix: a handful of the small yellow yo-yo-shaped beans are simmered in a pint of water until they flesh out into a tapioca-like mass tasting faintly of garlic and green peas. While they cooked, Prosatio Silban attempted the usual friendly banter about the weather and the afternoon’s martial games. But the Siddis only looked at him. “My lands are not like your lands. Where I am from, only the falcon and the serpent keep watch over wastes of rock and sand. But at night, we see the stars like no other men see them. “There is a city in the desert, of men who once were wise. They came to know that the stars and men were related — that the movements of one could be read in the movements of the other. Think of it! That the motions of something without this world be threaded inextricably with something within. The knowledge of what-is-to-what is great, for the man who can read it closely. And the secrets of what-is filled the libraries and minds of the men of the city. “Now you may think them wise, but they wise unto foolishness, for in seeing the stars they ceased to see themselves. For the stars are cold and hard and distant, demanding nothing more than to be worshiped in silence. And so the men sat in their city, their fine city of unnumbered mysteries. And so they worshiped. 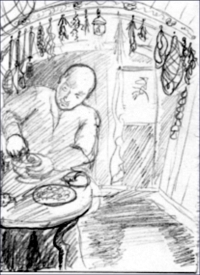 The smell of garlicky peas dragged Prosatio Silban’s attention back to the stove. He filled a bowl, added a spoon and napkin and brought it to the Siddis’ table. He wondered what to say. The Siddis spoke. I love this series, Neal, I wish you would compile and publish them one day! Please keep writing of Prosatio Silban’s adventures, I look forward to reading and re-reading them. They are brilliant, as are you! What a kind thing to say! I haven’t been able to get much writing done since I got sick, but you have inspired me to take another look at my assets. Thank you!